Director Jean-Pierre Melville’s controversial World War II drama Army of Shadows (1969), stars Lino Ventura as Philippe Gerbier the head of a small French resistance group. Along with his comrades, including the independently minded Mathilde (Simone Signoret), Gerbier must fight danger and treason from both outside and inside his circle, before the volatile situation and ever-present fear of danger reaches a dramatic climax. Is it right to find fault with a film held in such high regard by scholars the world over? Well yes, when the said film clearly contains its fair share of flaws. Unlike many films which have dealt with the subject of resistance fighters during the Second World War (such as ‘boys’ own’ takes like the Burt Lancaster vehicle The Train (1964)), Army of Shadows does nothing to glamourise this harsh and violent period of history. As a result Jean-Pierre Melville’s drama deserves praise for depicting with unsentimental realism, the turbulent lives of the men and women who gave themselves for the freedom of their country. 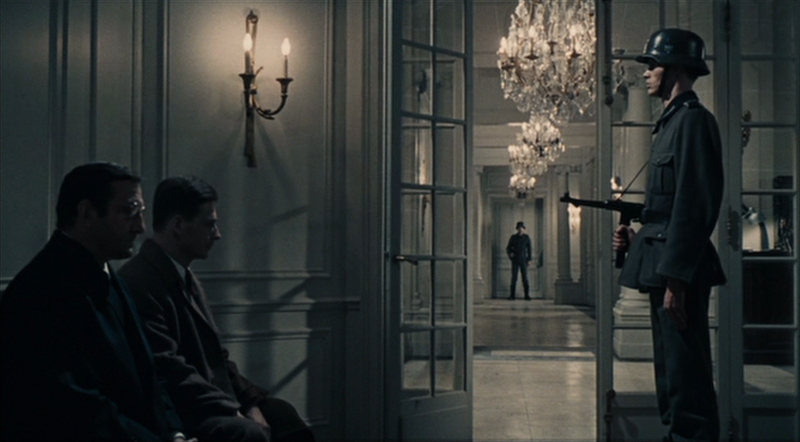 Melville’s minimalist, reportage style of filmmaking (blending pared back interiors with exteriors shot in authentic locations) lends itself perfectly to the austerity of war torn France. Scenes such as the opening shots of German soldiers marching in splendid isolation beneath the Arc de Triomphe, or the prison bunker where Gerbier is forced to literally run for his life, stick in the mind due to their unflinching starkness. However where the film fails when watched now, is in its lack of characterisation. Who are these people fighting against the German occupation? None of the main characters elicit any sympathy from the viewer for their cause. Ventura’s portrayal of Gerbier as a cold, isolated loner, though undoubtedly accomplished leaves you caring little as to his ultimate fate. In particular his obvious contempt for a group of British service men and women ‘enjoying’ themselves in a makeshift club during a London air-raid, makes him appear unfeeling and blinkered. Which highlights the film’s main flaw, namely any form of interaction between the central characters and the world outside. You never see, and hence never get any feeling, for the French citizens who these resistance fighters are supposedly willing to give their lives for. Atmospheric in its depiction of the constant air of suspicion in which people lived during World War II, this film is stronger than any sanitised Hollywood version would likely have treated the same subject matter. As a piece of filmic entertainment however, Army Of Shadows leaves a lingering and bitter aftertaste.